The bone-chilling opening scenes of “Henry: Portrait of a Serial Killer” carry a very ominous subtext: several of them replicate actual crime scene findings of real-life homicide. In their presentation is a pattern that amplifies their findings to the pinnacle of unnerving reactions; the camera cautiously swerves into view of deceased victims frozen in poses of terrible death, and the speakers vibrate with the muffled sounds of their final moments, most of which include horrific screaming as they are violently attacked and murdered. They are not necessarily related to one another, but a common bond does unite them – namely, they are victims of the same man, a creature of corrupt morality who must feed on the power of other’s fading life essences. What drives men like him to the brink of that urge? That is always the question, it seems, in a genre that must consider the antagonists directly. Some do so because their internal suffering has made it their only satisfying outlet. For a rugged loner like Henry, the notion of causing death seems merely to be an act of passing time in an existence that slogs along without purpose or joy. Those notions – and the underlying legend of Henry Lee Lucas, one of the most notorious of modern serial killers – are the anchoring points of this, a study in horror that isn’t so much about ominous shadows or disturbing supernatural energies as it is about the shells of evil that walk in synch with mainstream society. That piercing perspective is nothing inherently new in the scheme of film subjects, but rarely is it ever done in such an unsmiling and straightforward manner. Even a more well-known example like “The Silence of the Lambs” expanded on that principal psychology with great narrative embellishment, for instance. Yet “Henry: Portrait of a Serial Killer” goes against the grain of nearly all genre prototypes that came before, and to this day – nearly thirty years later – still resonates with nightmarish energies, as if possessed by a malevolent quality that keeps its subject matter piercing in this era of violent saturation. The story is a simple one, but direct: somewhere in the dark streets of Chicago, a man (Michael Rooker) wanders in and out of a placid existence carrying deep dark secrets. In principal, he is a mere loner who works as an exterminator; by night (or by boredom), he becomes a predator seeking blood, often driving up and down streets staring intently at pedestrians as if they are options to dine on in a never-ending menu of victims. The movie is committed to this routine in consistent narrative devices, and often we catch glimpses of Henry on the prowl before the camera cuts to a moment where he has left the scene, leaving behind a new victim. Dialogue emphasizes his conscious considerations. 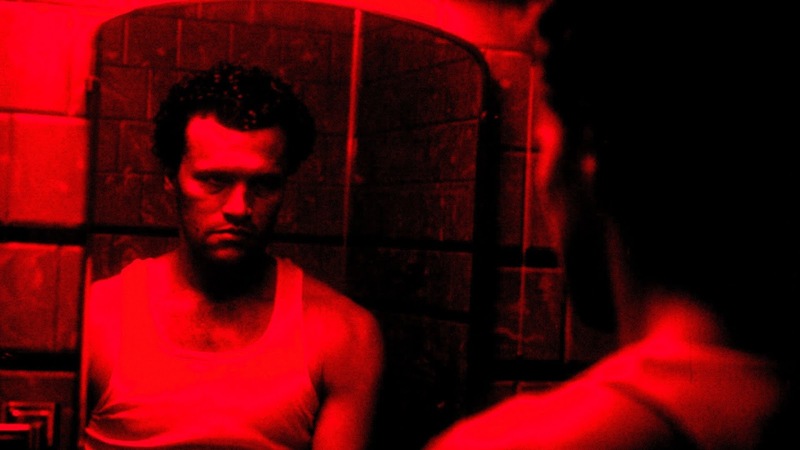 His roommate, an equally-monstrous sociopath named Otis (Tom Towles), provides him tipping points to discuss his overpowering urges (not to mention a strategy in picking the right victims). When Otis’ inquisitive sister Becky (Tracy Arnold) comes to stay with them both, conversations lead to additional reveals: 1) the suggestion that her brother eyes her with incestuous desire; and 2) Henry’s own descriptive account of him murdering his mother, of which he can’t exactly remember using a knife or gun. Becky does not coil in fear of these proclamations, but expresses fascination. She identifies with Henry, and for a very brief interval he adopts the role of her protective overseer. And all while their mutual enjoyment leads to awkward physical interactions, both Henry and Otis hit the road to launch themselves into a new wave of destructive crime, including attacking and murdering a television salesman after bantering about prices, and then sneaking into a house where they taunt, torture and murder an entire family of suburbanites right in plain view of the movie screen. The details are brutal and shocking, but there’s an added layer of significance to them: they aren’t choreographed with the spit and polish of mainstream endeavors. Even the camerawork, sometimes shaky and unfocused, seems to play right into the movie’s desire to be coarse and abrasive; any other depiction, you can imagine, might be like putting up a wall between the audience and the truth. But like many important horror movies in the artillery box of the past, this one arrived in my notice long after the desensitization of modern genre sensibilities. Many lose their potency when one relates them to their present experiences; because such films are often made in the rhythm of their own times, their lessons – however innocent or simple – lose an element of their vigor. What surprises me most are those that are made with such unforgiving sincerity; against the current that erodes all the shock and awe, they manage to persist by cutting straight to the core. When Henry first arrives in the frame of his own deadpan autobiography, there is no room to wonder what context his life – or his deeds – arrive from. They are ongoing cycles. What he puts us through on screen now is not about the games of creative movie psychopaths, but about the hard psychology of what he sees as the inevitability of identity. Fate has dealt him a hand of unrelenting cynicism, and he must play the game with all the thirst of a monstrous gambler. In the age of overexposure, much of this is seen as commonplace. Movies are churned out with alarming repetitiveness that deliberate the perversions of dangerous minds, and often we are asked to witness they mayhem they cause with gory precision. But they seldom emerge from a place of relatable consideration, because Hollywood prefers to place unrealistic distance between the inquisitive audience and the deadly sociopaths. To them, they are just tools used to propel acts of shocking violence. What does a movie like “Henry: Portrait of a Serial Killer” mean now when one sees it from that frame of reference? To me, its power is made all the more significant by the rigid manner in which it views the subject. The final scene, which denies us the possibility of a happy ending, is furthermore a visualization of the director’s own failure to arrive at a conclusive psychological definition, and just as it is his sobering confession to discover that his beast of a character is destined to endure, so must his audience accept it as part of the fabric of this culture. This is a movie that sends us into unsettling disquiet, and yet does it without undermining the seriousness of the subject matter to arrive at cheap thrills. Rare among the many pictures that will likely be viewed this Halloween, here is one that skips past the jolts and finds the internal demon.